HOHNER PIEDMONT BLUES Harmonica Set of 7 - Custom Carrying Zipper Case MIB. HOHNER Piedmont Blues Harmonica Set Set of 7. A,B,C,D,E,F,G. All original and unused. Zipper cloth case. 4 out of 5 stars - HOHNER PIEDMONT BLUES Harmonica Set of 7 - Custom Carrying Zipper Case MIB. 74 product ratings74 product ratings - HOHNER PIEDMONT BLUES Harmonica Set of 7 - Custom Carrying Zipper Case MIB. Popular with blues players, this 14 hole, Marine Band 365 (key of G) features full custom reed work, all surfaces flattened, nailed assembly replaced by bolts, and a sealed and nicely finished black Dymondwood comb for a nice warm tone. One of my favorite custom harmonica builds and popular with blues players, this 12 hole, Marine Band 365 (key of low C) features full custom reed work, all surfaces flattened, nailed assembly replaced by bolts, and a sealed and nicely finished black Dymondwood comb for a nice warm tone. Custom Seydel Session Steel in C. Full overblow / overdraw setup. Harmonicas out of the box does not have a proper quality settings for the use of progressive techniques, such as overblow and overdraw. Use three full octaves allows you to play any world music. Very soft and loud. THE HIGHEST LEVEL OF CUSTOMIZATION. HARMONICA IS SUITABLE FOR ANY TYPE OF BREATHING. 5 years warranty against breakage reed! Harmonicas are tuned to compromise tuning, 442Hz. Harmonics Custom Easttop are more stringent warranty. THE HIGHEST LEVEL OF CUSTOMIZATION. HARMONICA IS SUITABLE FOR ANY TYPE OF BREATHING. 5 years warranty against breakage reed! Harmonicas are tuned to compromise tuning, 443Hz. Harmonics Custom Kongsheng Solist are more stringent warranty. Key E. New professional custom harmonica Easttop overblow/overdraw. This harmonica is louder than others, and require less effort to play. This harmonica is the half valve. It allows you to decorate the play with draw bends. It is better suited for aggressive play Blues. Overdraw notes should not whistle. The quality of mass produced harmonicas is considerably lower than those produced by professional customizers. I employ all the skills and techniques I’ve learned and developed when I customize a harmonica. 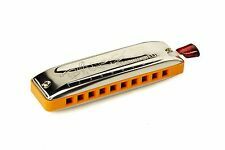 The quality of mass produced harmonicas is considerably lower than those produced by professional customizers. This harmonica is louder than others, and require less effort to play. This harmonica is the half valve. New Professional custom Easttop chromatic Bass harmonica. Key C.
This harmonica is louder than others, and require less effort to play. Handmade Customizing: Arcing, embossing, gapping, and other works. Unique customizing receptions. For your safety harmonica it is disinfected. Manual tuning: correcting the pitch of the tone; tuning is an important process in the production of harmonica. This model. is a signature limited edition with manual tuning. stable and natural. It is a wise choice for beginners and playing the piano. Key A. 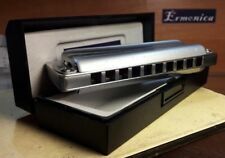 New professional custom bass harmonica Easttop Lucky 13. Key Eb. New professional custom harmonica Kongsheng Solist overblow/overdraw. Key E. New professional custom harmonica Kongsheng Solist overblow/overdraw. Key D. New professional custom harmonica Easttop overblow/overdraw. Key G. New professional custom harmonica Hohner Marine Band overblow/overdraw. Custom Seydel Session Steel in D. Full overblow / overdraw setup. Key F. New professional custom harmonica Hohner Marine Band overblow/overdraw. Key Bb. New professional custom harmonica Hohner Marine Band overblow/overdraw. Key A. New professional custom harmonica Hohner Marine Band overblow/overdraw. Key E. New professional custom harmonica Blues Harp overblow/overdraw. Key Ab. New professional custom harmonica Easttop overblow/overdraw. Key A. New professional custom harmonica Easttop overblow/overdraw. Key Db. New professional custom harmonica Easttop overblow/overdraw.